Our minister is Rev. Timothy C. Dice. “Rev. Tim” came to Westville Christian in the summer of 2006 to begin his pastoral work in Mathews. He is a native of the South Bay area of Los Angeles, California. He received a Bachelor of Arts degree in English from Chapman College (now Chapman University) and later completed his pastoral studies at Brite Divinity School on the campus of Texas Christian University (Ft. Worth, Texas). He received the Master of Divinity degree in 1991 and was ordained in 1992. In various capacities he has served churches in California, Texas and Virginia. Graduating from Lawndale High School in 1967, Tim attended El Camino Jr. College and was active in his local church (First Christian, Torrance, CA.) as a choir member and soloist, as a committee leader, an Elder, and an Adult Sunday School teacher. He also served in many capacities as part of Disciple Family Fellowship in the Southern California area. After leaving college in 1971, Rev. Tim pursued a career in the electronics industry for several years, but was always interested in Camps and Youth Ministry. He served as Youth Director at the Manhattan Beach Community Church and then responded to a call to ministry in 1988. Rev. Tim and his family (wife Mary and sons John and Jeremy) packed up and moved to Dallas, Texas where he commuted to Ft. Worth and attended Brite Divinity School at TCU. After three years of intense study, the birth of a daughter (Cady), and an internship as a youth minister, Tim received a Masters of Divinity degree in December of 1991. Rev. 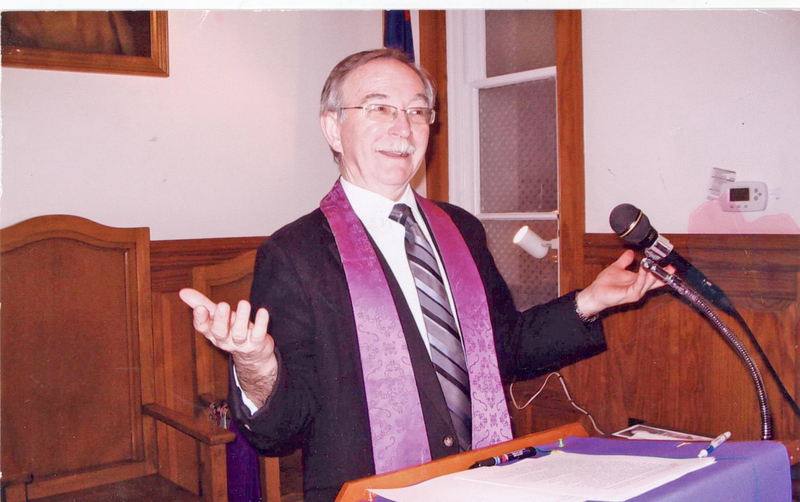 Tim was ordained by the Christian Church (Disciples of Christ) in January of 1992 and immediately began serving as Senior Minister at Stevens Park Christian Church where he had done his internship. In the summer of 1994, Tim was called to serve at West Point Christian Church here in Tidewater Virginia, necessitating another long, cross-country move for the family. In 2001, Rev. Tim accepted a position as Music and Choir Director at Olive Branch Christian Church in Toano, VA.
Rev. Tim has been a bi-vocational minister since 1997, uniting his ministerial efforts either with music ministry, teaching or tutoring students (Mathews High and York County Schools), or with work as a cemetery counselor. Currently, he works weekdays at Williamsburg Memorial Park as a Family Service Counselor. Of the Westville congregation, Rev. Tim says, “It’s wonderful to be a part of such a friendly and hospitable church. The members here make everyone feel welcome and appreciated. I am blessed every time I see or hear about the actions taken by individuals or groups in the church helping others. And I am delighted when the church opens its doors to all ages and supports programs of community outreach. Together as ‘pastor and people’ we exemplify what it means to be the church in the community and have the community in the church. If you are seeking a spiritual home for yourself or your family, I hope you will come to worship with us. We have lots to offer and a willingness to work on what we might not have. Perhaps YOU can help us be more of what God call us to be!